waking up early is not a usual thing to do in this island. many would prefer to wake up late to relax more. but definitely not for me. for the four days that i was there, i woke up as early as 5:30am everyday to witness how the beach looks like early morning. 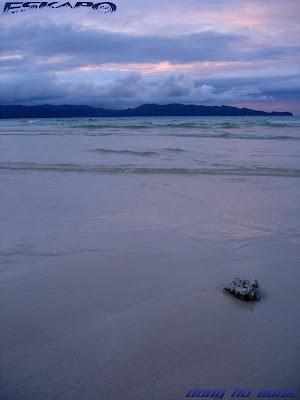 in the morning, one can either jog, bike or pick up some shells along the still untamed beach. i should say that it's the sweetest time to see how beautiful Boracay is. A. Attached or single? single. B. Best friend? too many. i even have a hard time defining a best friend as i almost consider everyone as my best friend. C. Cake or pie? cake. E. Essential item/s? camera, laptop, cellphone and the Bible. G. Gummy bears or worms? none. I. Favorite indulgence? chocolate and ice cream. K. Kids? none yet. L. Life isn’t complete without? love. naks! M. Marriage date? soon. soon. N. Number of magazine subscriptions: none yet, ill start subscribing next year. P. Phobias? deep sea diving. Q. Quotes? "manalo, matalo, masaya pa rin"
R. Reasons to smile? good people around. S. Season of choice? sunny days. T. Tag 5 people. Just anyone who wants to do it. U. Unknown fact about me? i like African music. X. X-ray or ultrasound? huh!? Y. Your favorite foods? lumpia. buti nalang walang snow sa Pilipinas...but I often wonder how this beautiful would look like if we have winter here....coz mapa-sunny or rainy pamana. Boracay is still drop-dead-gorgeous. 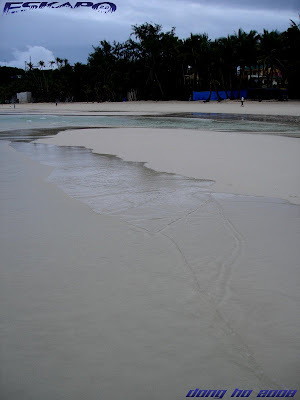 I think if I ever go to Boracay, I would opt to go during the off season too. More beach for me. Early morning at the beach is really beautiful. I love the peace and the cool air. You have amazing shots! I really wish I can go there. I am glad you are an early riser! These are marvelous. Mahilig ka siguro sa arts aside from photography. At saan naman ang hometown mo - pueblo makamiedo? Hahaha...you are right about the waking up part. 5.30 am is too early for me during the holiday, would rather relax and sleep a while more..lol. Beautiful photos. Nice to know some facts about you. Are we hearing wedding bells soon? Please take some photos of how a wedding in philippines looked like. Should be very different from my recently posted wedding pictures in my post. Have a nice week ahead. ang ganda talaga ang Bora... kahit anong oras. Even when it's gloomy it's still beautiful! Super talaga sa ganda ang boracay,kahit litrato mo lang dong,feeling ko...nakarating na ako. Salamat s'yo ng marami dong! ano na naman ang next destination mo,pagkatapos ng boracay? 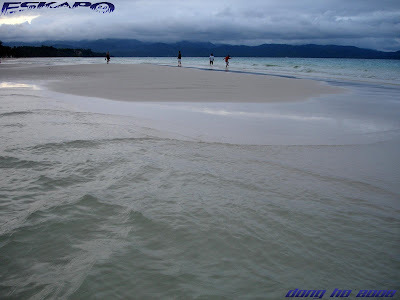 >pusang-gala, hahaha... maybe our beaches wont be as beautiful kung may snow. that's the advantage of being a tropical country. big guys nga sila pero hindi naman ibig sabihin na malaking tao ka na rin. kung alam mo lang kung gaano ka simpleng tao sila, siguradong matutuwa ka. humble mostly ang mga backpackers. 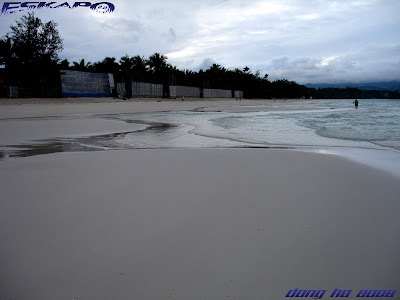 >photo cache, there's both advantage and disadvantage of going to boracay during the peak and the off peak season. as long as there's no typhoon coming in, you'll definitely enjoy boracay during the off peak season. i'll be posting some tips on going to boracay in the coming post. not sure when yet. just keep in touch. >antoine, sana nga maalagaan ng mabuti ang boracay. salamat ulit sa header. >hi aisha, thanks. that's the best time to enjoy beach side view with less people. >hi myslykemeeh, hahaha... hope you get there someday and make sure not to miss out waking up early morning to see its undisturbed beauty. >borneo, yes. it's worth waking up early. >hi mel, matagal na itong byahe ko sa boracay. ngayon ko lang napopost kasi sa dami ng nabibisita kong lugar nung time na yon. natatawa naman ako sa paikot ikot mo dun sa buhangin. >hi alicesg, wedding bells? not yet. hehehe... it's just a soon-to-post. i think wedding here is close to those in the western part of the world. slightly similar to that in your country too. havent had the chance to feature wedding pictures yet. >hi nanaybelen, tama po kayo dyan. sa hapon lang medyo marami na talagang tao. >luke, you're right. i thought you're back in the blogosphere. >hi merce, next destination ay ang northern at central area ng luzon. I like the simple, quiet look of the beach. It seemed like it's sleeping and snoring peacefully awaiting the sun to kiss them awake gently. Reminds me of my early morning days watching my babies sleep and kissing them and watch them stir contently.... glorious! uy, hindi ko napansin yan ganyan noong nsa bora kami. palibhasa'y tamad magsibangon kapag umaga dahil puyat galing sa gimik pag gabi. hahaha. ganda pala noh! up to where in northern luzon?so when did you go there?im eager to read your posts on that..maganda pa rin ang boracay kaya im kinda hesitant to feature beaches here in HK.. When I visit the beach I love to be out first thing in the morning, being the only one out there. Thanks for your visit. I'll come and get some wonderful sun in your world and you can marvel at the snow in mine! daan lang ako dito... bisita lang poh! Wonderful images... looks so peaceful and wonderful. wow! gusto ko din pumunta dyan!! nice pictures din!! nakakaengganyo pumunta dyan!! nga po pala, pa add ng link ^^ thanks!! >hi em, well described. it is indeed like that. hehehe... sweet sweet morning. >hi blue rose, hehehe... sarap nga matulog pagkatapos gumimik. pero at least once try mo rin gumising ng maaga. para makita mo ang natural nitong kagandahan. >hi aquamarine, last month kami nasa central and north luzon. abangan dahil magkasama kami dun nila lawstude. alam ko may maganda nga ding beach sa hk. feature mo yan dahil marami pang hindi nakapunta dun. >rob, hahaha... same here. even though how tired i was the previous day, waking up early in the morning is still worth doing. >hi ms donna, salamat sa pagdaan. >sidney, maraming salamat! hehehe... you made me laugh. >cyndirellaz, kaka enganyo talaga. thanks. i will. how i wish makapunta ako dyan...naku! 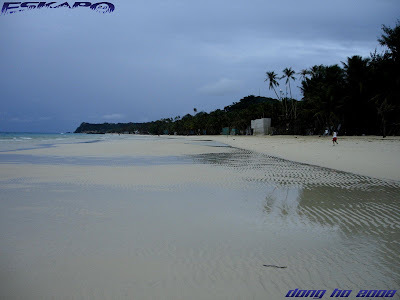 i also prefer to walk in the beach early morning coz nakakarelaks sha plus konti lang ung tao sa beach. 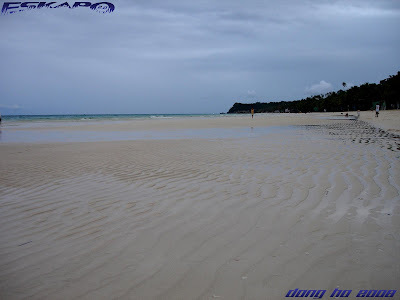 ganda ng kuha mo dong sa beach eventhough mdyo gloomy yung panahon =D. 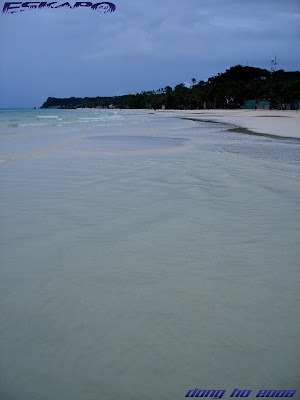 this is the boracay i love...quiet except for the gentle sounds of the sea. I like the 2nd picture. Ako kapag bago sa isang lugar lalo na sa probinsiya, gumigising ako ng maaga para maasilyan ang sunrise except kapag rainy season. Sa bora gumising ako ng maaga pero huh hindi ko nasilayan ang sunrise dahil nasa station 2 kami at hindi makikita ang paglitaw ng araw dun. aha life is not complete without love at bakit single ka pa? jokes. fear mo pala ang deep diving ha. lol. bakit naman naging worst habit ang pagbasa ng travel magazine? 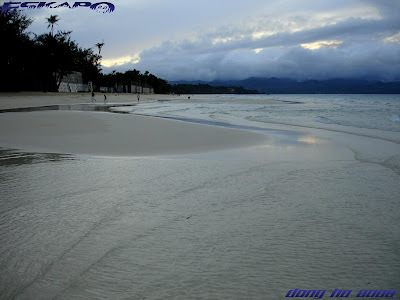 nice gyud and shore line sa boracay, nidot kaau skiman! bro, mapaumaga, mapagabi, at kahit ano yata oras nakuhanan mo sa boracay ah. di ka ba natulog? hehehe. ayos to, ganda ng mga shots. You must be living in Boracay man hehehe....You're very lucky! 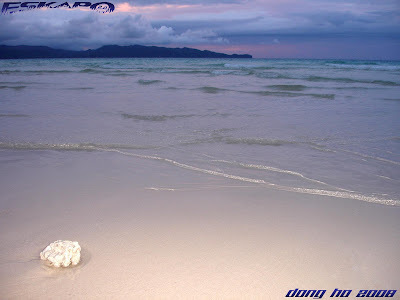 oiiist parehas tayo Gemini hehehe..
Beautiful light at a stunning beach! >hi sheng, i can imagine how you've walked to find that pandesal. hehehe.. we were there from Sept 30 till October 3. >theonoski, salamat. sakto ka dyan. lalo na sa boracay, konti lang talaga ang tao pag ganung oras. kaya sayong sayo lang ang beach. >hi luna, same here. that time of the day is the sweetest time in boracay. >redlan, ako din hindi ko nakita ang sunrise ng buo kasi tinamad akong pumunta sa bulabog beach. the second photo is also my favorite in this set. life is not complete without? love. "at bakit single ka pa?" >hahaha... yung love naman para sa lahat. di ba? fear is deep diving> true kasi medyo wala ka ng makita pag deep diving. sanay ako sa snorkeling lang kung saan kita lahat. >miong, sakto bai. bisan sa bantayan pwede pod kaayo. >oman, hahaha... parang hindi nga eh. siguro yung mga alas dos hanggang alas kwatro na lang ang hindi ko nakuha. >joops, i was there just for four days. 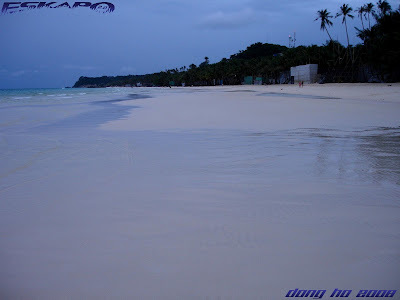 i just post the photos one by one for the people to see boracay in many angle and aspect. >hi chubskulit, worst because i read a lot of it lately as i am planning for a business in this industry. >jm, it definitely is a stunning beach. 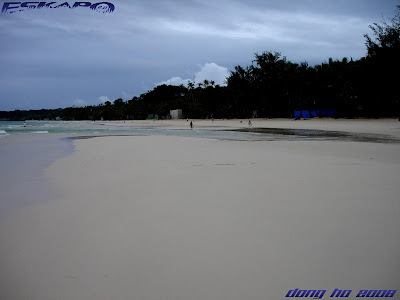 Gloomy or not, Boracay is still love - especially with your photos. Ganda naman ng mga kuha....ikaw Dong yun gusto kong i-add kaso di kita makita buti nlang epal ako sa ibang blogs! add kita ..bleeh! Mga wat time to? 5:30am? Oohh, Gemini ka din. Apir! I checked Cebu Pac's wala namang 588 na lumalabas pag booking phase na. The photos are really nice. Soooo love it! paskong pasko pero parang valentine's day na...napapakanta tuloy ako ng..
>hi joy, yes it is still a beach people love to visit. thanks. >darkhorse, maraming maraming salamat. lately na nga lang din kita nakita. buti na lang maraming network. >gillboard, ganda talaga dun. hindi po ako taga dun. nandun lang po ako for four days last sept 30 to october 3. >hi chyng, around mga 6am na yan. ayos dami pala nating gemini dito. regarding cebu pac's promo, depended rin sa availability ng slot. >joshmarie, tama ka dyan. good morning. >kegler, tama. kaya dinadayo talaga itong magandang isla ng boracay. What a stunning view and very peaceful. So good to relax just sitting on the sand, admiring the sights and hearing the sounds of the waves. ang ganda tlga ng pilipinas noh..gusto ko din pumunta ng bora..pagkapanganak ko.. It really look so calm.I would be walking at this time. I need to put aside again my plans on going home.Sayang,i've found pa naman the right fare for us. I'll settle to see boracay na lang through your eyes. Life isn't complete without love. Same here, chocolate and ice cream are my indulgence! Plus, plus +books. Can I grab this tag? so, you have a lot of best friends too? I had the same problem defining that word either, hahaha! You're still in Bora, dong? Natawa ako kay Lawstude. Napnsin ko rin yun ha. Di ka yata nagpahinga sa kakakuha ng pics sa Boracay. lol. Buti may spare bat ka or mabilis lang talaga ma-charge ang batt mo. Joke lang. Lovely photos! 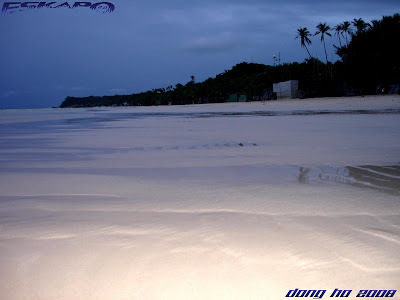 Only proves that Boracay is beautiful any time of the day. Really it's worth waking up early in the morning to photograph such beautiful beaches. Aabangan ko na lang ang iba mo pang distinasyon. 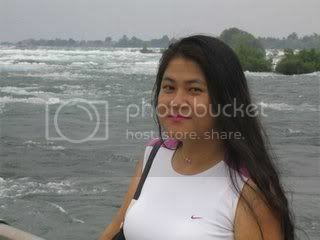 My hubby and I would like to see this place when we go back there in the Philippines soon...Such a nice place.